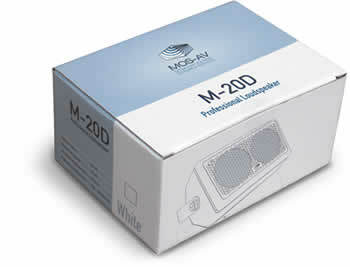 M-20D and M-40D are small powerful full range speakers with fair bass reproduction and balanced frequency response. Small size and great performances make them an ideal choice in hidden locations with space limitations and applications such as front fills and under balcony delay loudspeakers. U brackets are available for easy mounting on ceilings and walls. Loudspeakers and brackets are available in any RAL color. After years of experience in setting up the PA sound systems, we have found out that one of the big challenges is finding the small size front fill and delay speaker that meets the architectural demands while the sound quality still remains high. Due to a lack of that type of speakers on the market, MOS-AV has engineered the professional loudspeaker which reconciles architectural and sound demands. We also make custom speakers that meet special requirements of each project. All the components are from the European Union and the assembly is done in Serbia.